Released as Exhumed in Europe and A.D. 1999: Pharaoh's Revival in Japan. Differences are minimal (title screen, etc.). 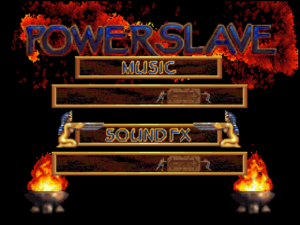 PowerSlave install can be converted to Exhumed install, and vice versa, using this. DOS/32A is a more advanced extender and open source replacement to DOS4GW. It can improve both performance and stability of PowerSlave/Exhumed. A patcher utility that provides bug fixes and enhancement such as proper strafing, autorun, toggleable mouse look and higher resolutions. Patch works with both Powerslave and Exhumed. Earlier versions of this patcher have issues with DOS32A above (gives a runtime 200 error). Use the CauseWay Extender instead. Easier and more modern control scheme. Requires DeHacker's forced mouselook, C key fix and strafing fix. Allows easy browsing and management of user maps. Also allows jumping through default levels. El-Gizah - Single map with some custom art. It is advised to use the rescripted version as it includes a batch script to automate file renaming. 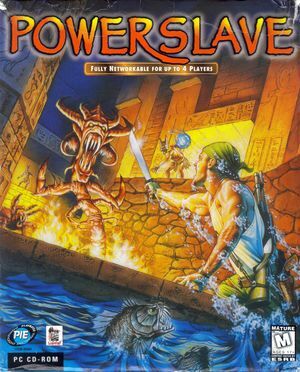 For DOSBox use DOSBox IPX/modem emulation. This page was last edited on 30 March 2019, at 02:09.